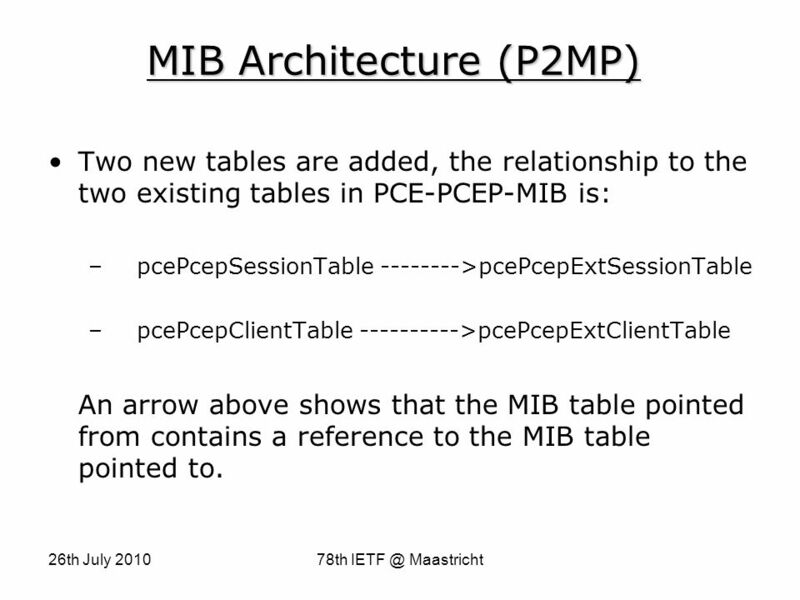 3 26th July 201078th IETF @ Maastricht MIB Architecture (P2MP) Two new tables are added, the relationship to the two existing tables in PCE-PCEP-MIB is: – pcePcepSessionTable -------->pcePcepExtSessionTable – pcePcepClientTable ---------->pcePcepExtClientTable An arrow above shows that the MIB table pointed from contains a reference to the MIB table pointed to. 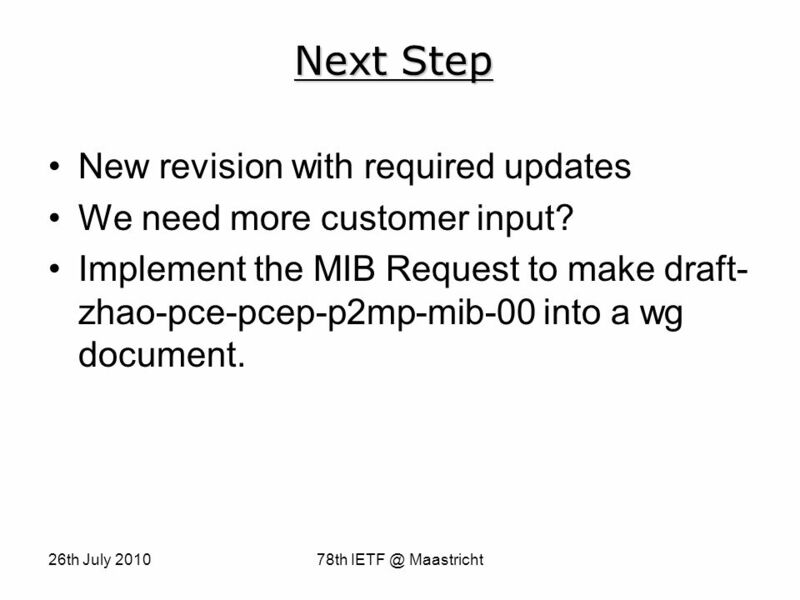 7 26th July 201078th IETF @ Maastricht Next Step New revision with required updates We need more customer input? 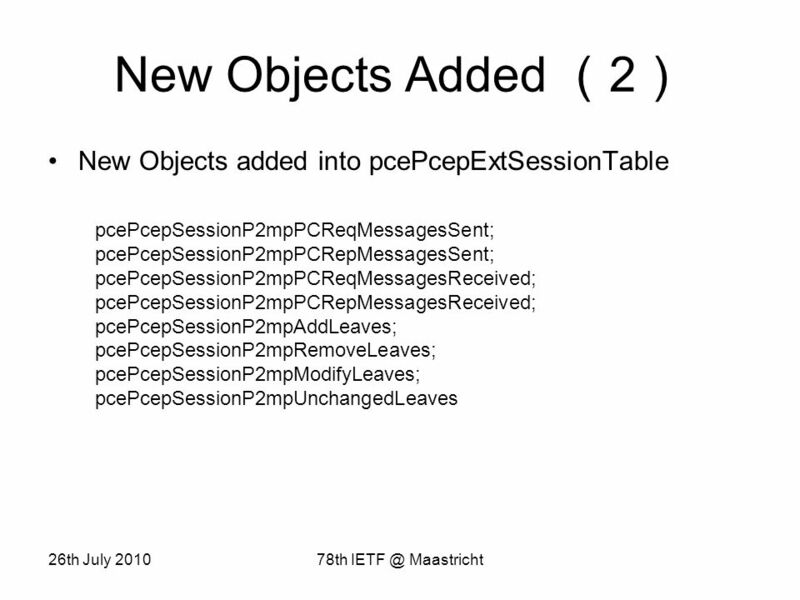 Implement the MIB Request to make draft- zhao-pce-pcep-p2mp-mib-00 into a wg document. 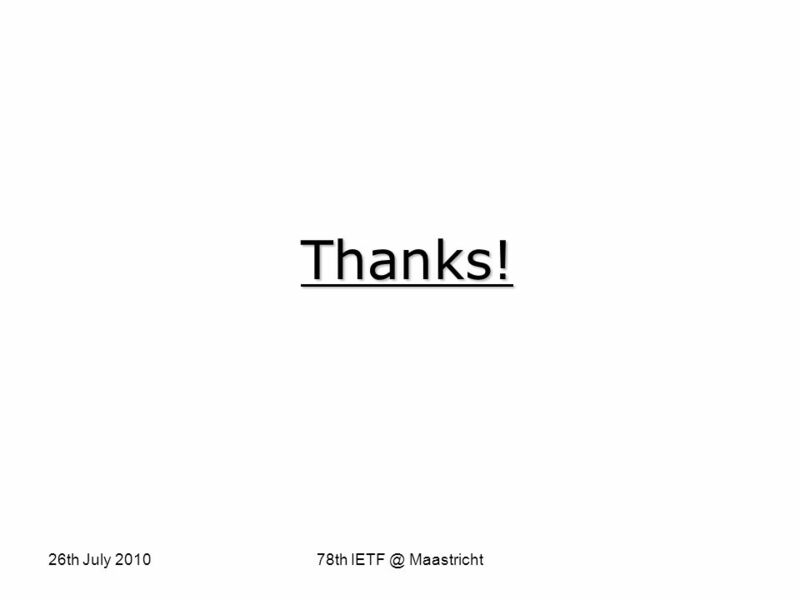 8 26th July 201078th IETF @ Maastricht Thanks! 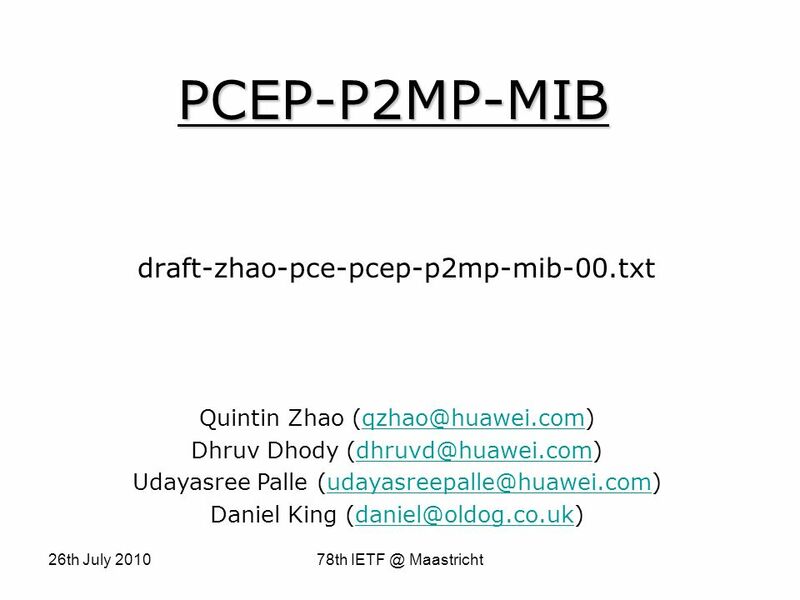 Download ppt "26th July 201078th Maastricht PCEP-P2MP-MIB draft-zhao-pce-pcep-p2mp-mib-00.txt Quintin Zhao Dhruv Dhody"
An extension to RELOAD to support Direct Response Routing (& Relay Peer Routing) Ning Zong Xingfeng Jiang Roni Even Yunfei Zhang draft-zong-p2psip-drr-00. 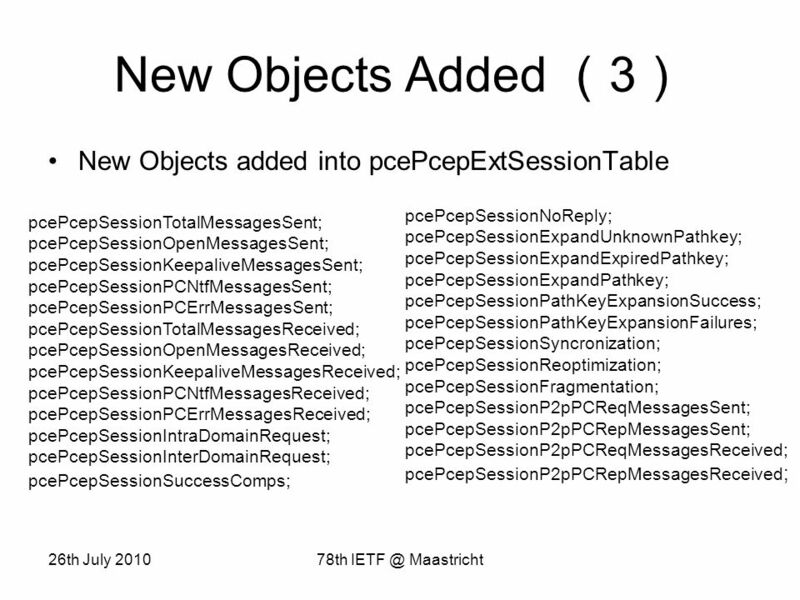 71 th IETF – Philadelphia, USA March 2008 PCECP Requirements and Protocol Extensions in Support of Global Concurrent Optimization Young Lee (Huawei) J-L.
1 SIP End-to-End Performance Metrics (draft-ietf-pmol-sip-perf-metrics-00.txt)draft-ietf-pmol-sip-perf-metrics-00.txt 71 st IETF Conference PMOL Daryl. 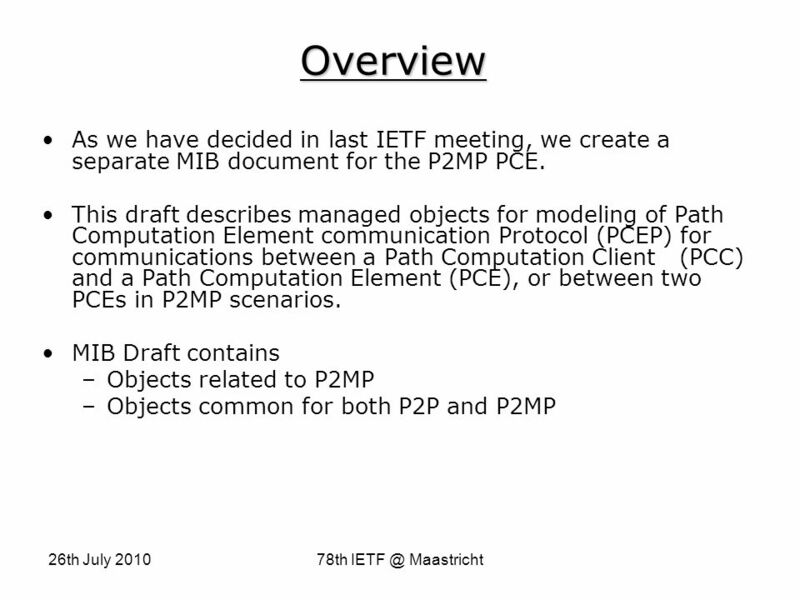 IETF 77, Maastricht, Netherlands, July 25-30, 2010Page - 1 Information Modele Electro-Optical Multi- Layer G.709 network draft-xie-ccamp-multi-elec-opt-network-ext-req-00. 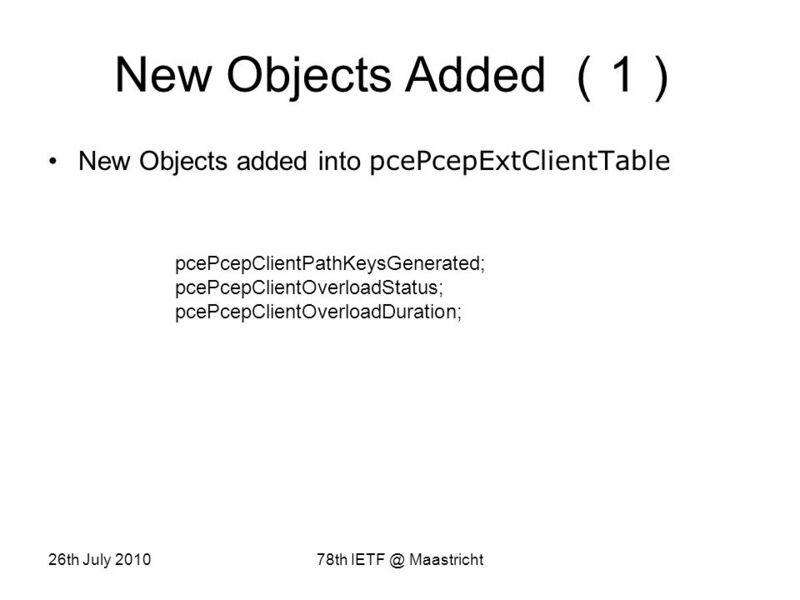 Extensions to the Path Computation Element Communication Protocol (PCEP) for Point-to-Multipoint Traffic Engineering Label Switched Paths draft-ietf-pce-pcep-p2mp-extensions-05.txt. P2PSIP Security Overview and Risk Analysis Haibin Song Dan York Marcin Matuzswski Christian Schmidt Roni Even. Slide title :40-47pt Slide subtitle :26-30pt Color::white Corporate Font : FrutigerNext LT Medium Font to be used by customers and partners.